I would like to ask all, to help my dear friends Mike and Liz 2 years ago Liz lost her brother and his 3 children in a tragic house fire. To make matters worse to find out it was an arson a heartless act. As a result of the fire she lost her 2 nephews Michael 2yrs, Donavon 11 months, and her niece Layah 3yrs, who she had custody of since her birth, and took care of as a daughter, along with her only brother David 32yrs. His birthday was the following day. 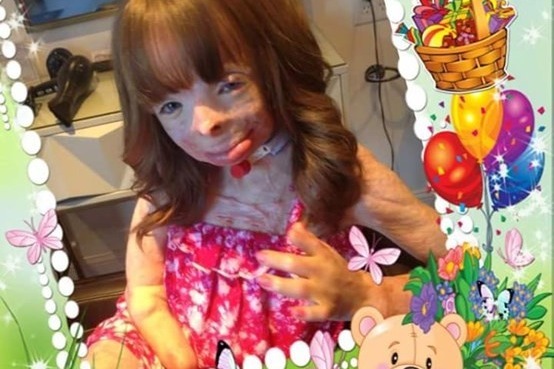 The wonderful news is her only living relative Safyre 5yrs, survived the fire, she was burned over 75% of her body, her right hand amputated, and just recently had he left foot amputated. 10 months of initial hospitalization where Liz consistently traveled to visit her, offering hope, encouragement, prayers,and most of all LOVE to fight to recover. Safyre went home with Liz and her husband Mike and there 4 children. They took her in not thinking of the consequences that followed when you care for anyone that needs a tremendous amount of medical care. All of the family have changed so much of there lives for Safyre without giving it a second thought. Liz and Mike have 2 beautiful twins Jasmine and Jacob, the same age as Safyre. There is times Safyer needs operations and treatments out of town in another state and needs to be in the hospital for weeks this taking their mother away and leaving their father to take time off from work to help with them at home, yet they wouldn't have it any other way she is there sister, daughter and they love her. So after 13 years of working at CDTA in Albany, Mike has lost his job not only do I believe its because of him needing time off to help with his niece they left him with no severance pay and forcing him to resign in order to get his pension, leaving unemployment in question. Mike's job was their only source of income, Liz is a stay at home mother/caregiver to an elderly woman she refers to as Gram's. A woman who babysat Liz when she was a child. To make things worse they felt it was extremely important to keep there children in the school they started in. They needed a bigger home with the new addition to the family, then after finding a new home they found out the home they are renting is a home in foreclosure. A lawyer has taken over the property and no longer is keeping up with the care of the property. They feel it's pertinent to find a new home. In the same school district the school and community who have been amazingly accepting and warm with Safyre. So to summarize this my dear friends need help they need to move and find a stable home and van for their family. So any thing would help, so please help them in their time of need they didn't think twice of helping there beautiful niece when she woke up one dreadful morning to find her father, brothers, and sister had made a trip to heaven. The financial burden this family has faced is overwhelming on them, Mike had shoulder surgery earlier this year and was out of work for months, Mike having to take unpaid time off of work because Liz is at the hospital with Safyre, also the van they purchased to travel her safely back and forth to hospital trips is about to be repossessed. Through all the heartache, stress, and financial burden this family continues to have a great hold on hope, smile through their adversity, their strength is LOVE and LOYALTY to their family. They share this hope and strength on a Facebook page https://www.facebook.com/Schenectadyssupersurvivor?fref=ts they established to give updates on Safyre and in hopes of giving hope to others that no matter what, you can get through anything. I am asking every person that reads this to think about how much this family has lost and gave up to do the right thing and how many of you would be able to give up this much of your life to help this beautiful child as this family did. Please anything would help and nothing would mean more to me than to see my friends have one less pressure to worry about.